That's all from the BBC Africa Live page today. Keep up-to-date with what's happening across the continent, including in the Angola elections by listening to the Africa Today podcast or checking the BBC News website. If you want to improve your memory, lend someone money." And we leave you with this picture of a man cycling home as the sun sets in Zimbabwe's capital, Harare. An opposition activist has urged Angolans to watch every step of the vote-counting process following today's general election, and to take pictures of everything they see in an effort to record fraud, should it happen. This kind of surveillance is part of the culture now, one young voter told me. I met Sergio Lopez, 28, after he had voted in the business district of Angola's capital, Luanda. He said that he felt there wouldn't be much trouble with the counting of votes because it would be all over WhatsApp if there were. He said he was part of the "3G generation", referring to people who were constantly connected to the internet on their phone. If anything suspicious happened, people would make it known to their WhatsApp groups, he said. This is a significant departure for Angola which has had the same president for 38 years - ten years longer than Mr Lopez has been alive - and where it is illegal to insult the president. 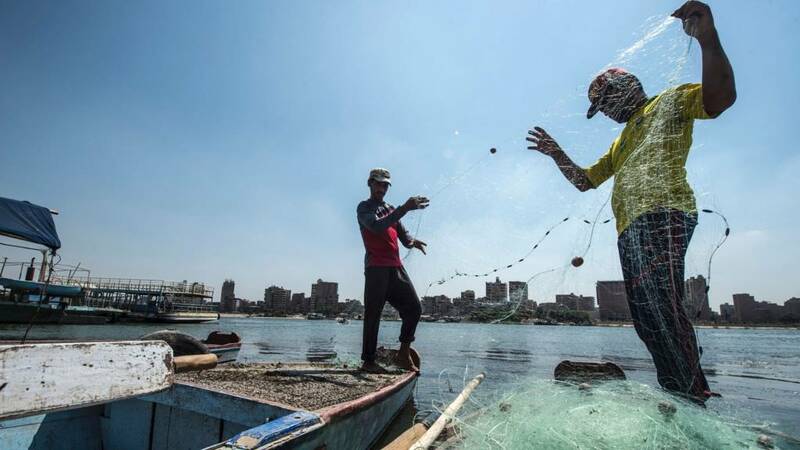 The authorities in Egypt say they have broken up a ring of criminals who were involved in the trafficking of human organs. Police have shut down a medical centre near the capital, Cairo, that specialised in kidney transplant, and have arrested a dozen doctors and members of staff. The doctors are alleged to have removed organs from poor people, including some refugees, for use by wealthy Egyptian and foreign patients. Seven years ago, Egypt criminalised the trade in human organs after the World Health Organization ranked it among the top five offenders in the world. Three policemen in Niger have been sentenced to one year in prison and fined 15 million CFA francs ($27,000; £21,000) for assaulting a student in an incident that caused an uproar in the country last April, BBC Afrique reports. The officers beat a university student with a truncheon during a student demonstration to demand better studying conditions and access to scholarships. The court found the police officers guilty of premeditated assault. An attempt to illegally take 15 young women from northern Mozambique to Saudi Arabia has been foiled, police say. The alleged traffickers were Mozambicans, Saudis and Tanzanians, some of whom had been arrested, police spokeswoman Malva Brito said. The women, aged between 21 and 28, were allegedly offered job and education opportunities in Saudi Arabia. Most Mozambican women who are trafficked to other countries, including neighbouring South Africa, are forced to do hard labour, farming and prostitution. Many African women complain that in Saudi Arabia they are forced to work in slavery-like conditions, and are abused by their employers. The hashtag #MPsPay is trending in Kenya as people react to a comment by MP Gladys Wanga, who serves in a parliamentary commission that deal with lawmakers' welfare, that their salaries should not be cut. In June, the Salaries and Remuneration Commission proposed a 15% cut on their monthly salary of $7,200 (£5,500), as well as a reduction of some of their generous allowances, as part of a plan to slash the public sector wage bill. Libya’s former Prime Minister Ali Zidan has been released by his abductors in the capital, Tripoli. The city’s most powerful militia, the Tripoli Revolutionary Brigade, kidnapped him from a hotel in the capital ten days ago, according to witnesses. This armed group is nominally under the internationally recognised government in Tripoli. It’s still not clear why the militia kidnapped the former prime minister, but his family has confirmed to the BBC that he was released on Tuesday night, and that he’s in good health. They also say that he will remain in Tripoli until Friday, and plans to hold a news conference in an effort to "clear his name" over corruption allegations made against him in the past. Mr Zidan led the Libyan government from 2012 to 2014, when he was ousted by parliament. At that time, the prosecutor-general’s office imposed a travel ban on him for alleged financial irregularities, which he denied. UK Foreign Secretary Boris Johnson has said that Libya was Europe's frontline in its struggle against illegal migration and terrorism. Mr Johnson, on a visit to the capital, Tripoli, agreed with Libya's Prime Minister Fayez al-Sarraj that the EU need to do more to help tackle the migration crisis. He said different countries had conflicting agendas in its response to the migration crisis. Mr Johnson said Britain would help Libya to set up an electronic border in its southern desert. The head of African athletics says the continent will bid to host the 2025 World Championships. Africa has never staged the biennial event, which started in 1983, despite being home to many world champions. Hamad Kalkaba Malboum says he believes a bid is set to come from one of six African nations. "We are talking with Kenya, South Africa, Nigeria, Algeria, Egypt, Morocco - those countries have the facilities," said the Cameroonian. "I have very positive sounds from some of them," added the president of the Confederation of African Athletics (CAA). Chad has ordered the closure of Qatar's embassy in the capital, N'Djamena, and the departure of its diplomats after accusing it of trying to destabilise the country from neighbouring Libya. It gave the ambassador - along with the rest of the embassy staff - 10 days to leave. A statement from the foreign office said the decision had been taken because of Qatar's "continued involvement in activities meant to destabilise Chad from Libya". It is unclear if this latest move is a result of a proxy battle being waged between Qatar and its Arab neighbours in the region. Chad recalled its ambassador to Qatar when the dispute broke out in June. Saudi Arabia and its allies imposed sanctions on Qatar after accusing it of supporting extremist groups - an allegation Qatar strongly denied. Newspapers and magazines in Tanzania will have to apply for new licences after a government directive revoked permits which allowed them to publish. The government's Director of Communication, Hassan Abbas, told journalists in the main city, Dar es Salaam, that the media groups have until 15 October to apply for the licences. The move is likely to be seen as another affront on press freedom by President John Magufuli's government, and an attempt to silence publications deemed to be critical of his administration. Bakari Machumu, the executive editor of the publishing group behind The Citizen newspaper, told the BBC that the new licences would have to be renewed annually. The move would burden operating costs across the industry and negatively affect businesses, he said. Mr Machumu added that the directive meant that publications which failed to comply will be forced to close, and this would "infringe on the right of the public to get information from the various media outlets". The government has, however, dismissed the criticism. It says the move will enhance professionalism. The directive, which will affect more than 100 newspapers and magazines, has caused worry among owners of electronic media organisations that they are next in line. The pay cut, which includes a reduction on some generous allowances, was due to come into effect after the 8 August election. In June, the Salaries and Remuneration Commission said the cut was part of a plan to reduce Kenya's public sector wages by 35%. Kenyan MPs are some of the best-paid lawmakers in the world, and the pay cut is part of a government plan to reduce spending on public sector wages. The average income in Kenya is $150 (£117) per month. Voting is under way in Angola, where President José Eduardo Dos Santos is stepping down after 38 years in power. He is not contesting this election and the current Defence Minister Joao Lourenco is standing for the governing MPLA party. Gunmen have freed 20 prisoners after ambushing a police lorry in South Africa's main city, Johannesburg, police have said. The men, armed with rifles, surrounded the lorry and broke a lock to free the prisoners who were being transported from court to jail, police added. Quote Message: They were awaiting trial prisoners charged with various crimes including armed robbery‚ housebreaking and theft and possession of drugs." They were awaiting trial prisoners charged with various crimes including armed robbery‚ housebreaking and theft and possession of drugs." Polie have launched a manhunt for the gunmen and the prisoners. Potential buyers have to pay a refundable deposit to register and bidding will continuing until Friday. Auction organiser John Hume, who runs the world's biggest rhino farm, hopes to sell hundreds of horns by the time the auction closes. A South African court ruled that the auction can take place, despite opposition from the government and some conservationists who fear that the sale will fuel the illegal market. A five-day strike call by the opposition in Ethiopia's Oromia region is being partially observed. Businesses and transport services are closed in some areas in protest against a recent hike in taxes for small businesses and the imprisonment of opposition politicians. There is a heavy security presence in some towns. Other areas are relatively unaffected. Deadly opposition protests in the Oromia and Amhara regions led to the imposition of a state of emergency last year. It was lifted earlier this month. Read: What was behind the protests? More than 650 people died during anti-government protests that began in 2015.Image caption: More than 650 people died during anti-government protests that began in 2015. At least 11 people have been beheaded in an attack on a checkpoint controlled by Libyan military strongman Khalifa Haftar, a spokesman for his forces has said, AFP news agency reports. The dead included nine soldiers and two civilians were beheaded, Col Ahmad al-Mesmari said. He blamed the militant Islamic State (IS) group for the attack on the checkpoint, about 500km (300 miles) south of the capital, Tripoli, AFP quoted him as saying. Angolan officials are reporting a high voter turnout in the general election which heralds the end of President Eduardo dos Santos' 38-year rule. A music video by renowned Nigerian artist Olamide caught the eye of the Federal Ministry of Health for allegedly violating the Tobacco Control Act. It is a song that will make you move your feet but it has caused some controversy in Nigeria. The award-winning Olamide wanted to show the lifestyle in the area he grew up, in the video for his hit song Wo. The video, which has close to one million views on YouTube, has a scene showing young people smoking. Nigeria’s Ministry of Health tweeted that this violated the country’s Tobacco Control Act, and reports alleged that the song was banned by the National Broadcasting Commission. But a spokesperson for the commission has confirmed to the BBC that there was never a ban on the music video. Olamide has edited his video with a tobacco health warning and an age restriction on television.